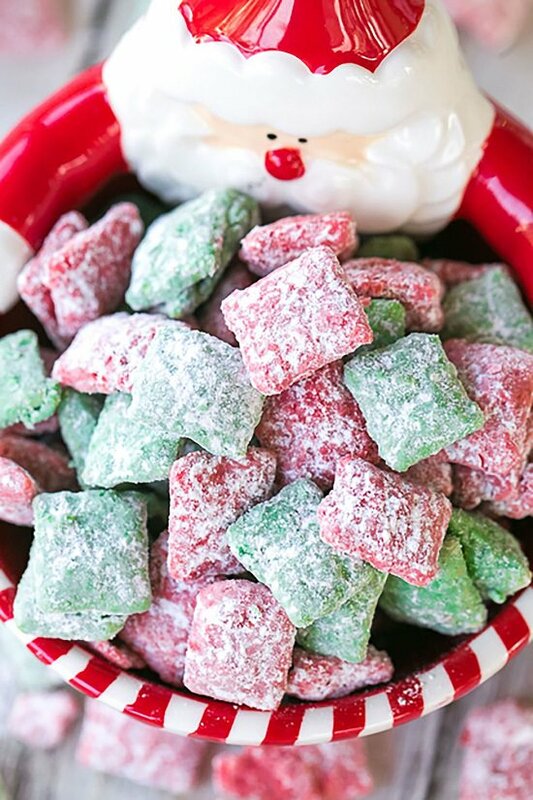 These are the most delicious and easiest Christmas Treat Recipes available on the internet! 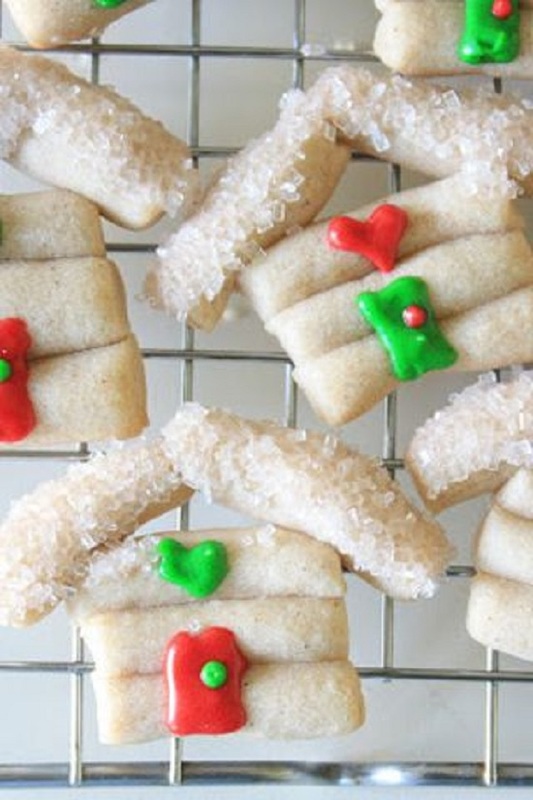 These no-mess, easy-to-bake vanilla cookies are flavored just enough to go easy on your palate. Learn how to do it at wholefully. 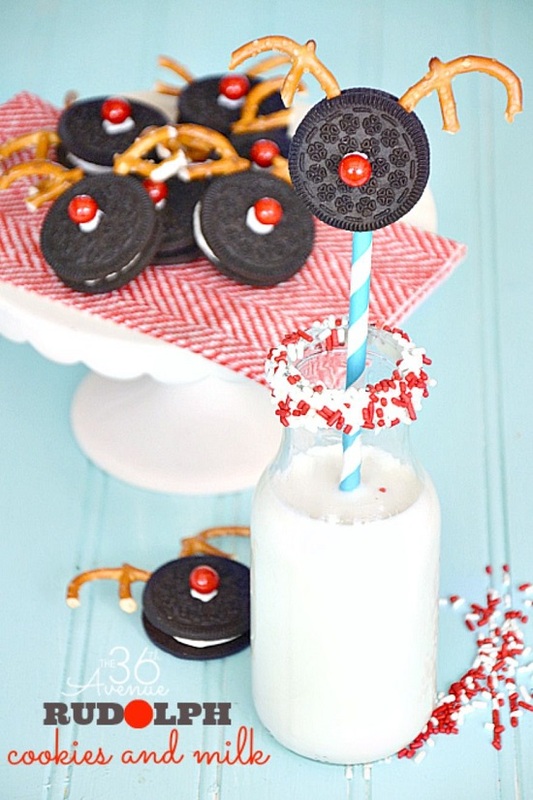 It’s always magical to see how fast this cute Oreo pops disappear from the table. Visit itsalwaysautumn for the tutorial! 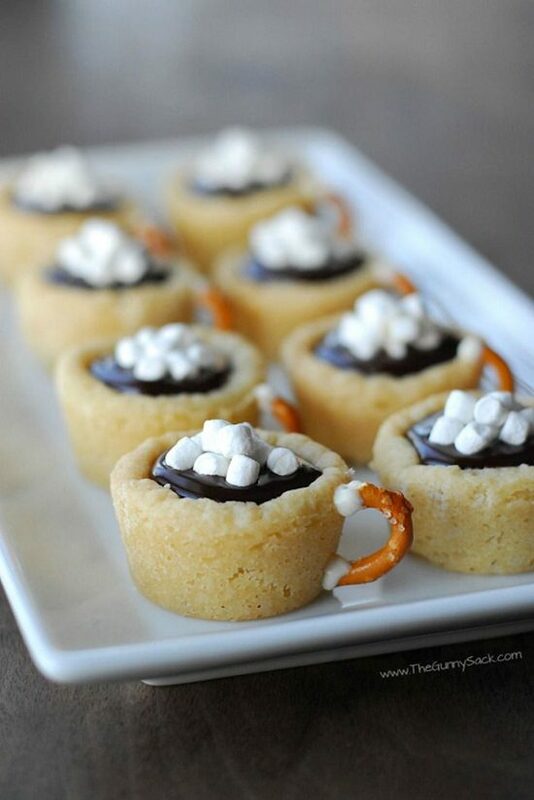 Here’s a charming dessert idea that lets you go overboard with your creativity and flavors. The recipe is at thebearfootbaker. 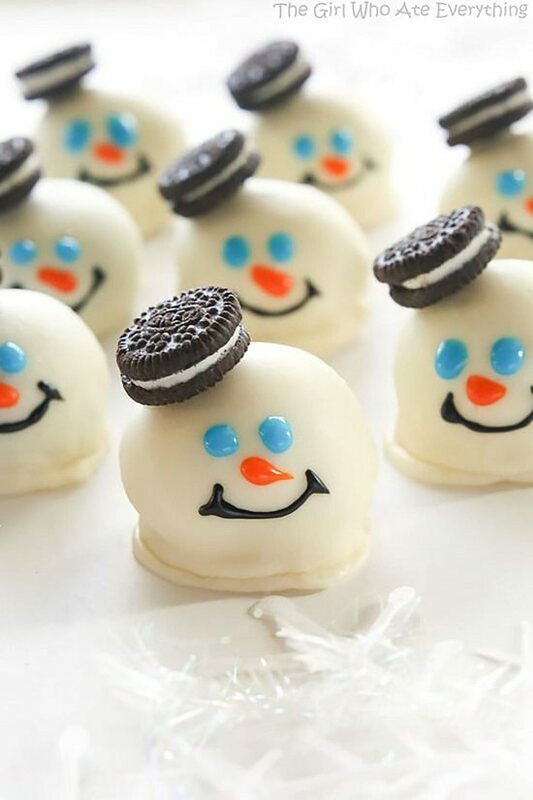 These snowmen donuts are perfect desserts to make ahead of the winter, as they require no snow and no oven either. The simple steps are here! 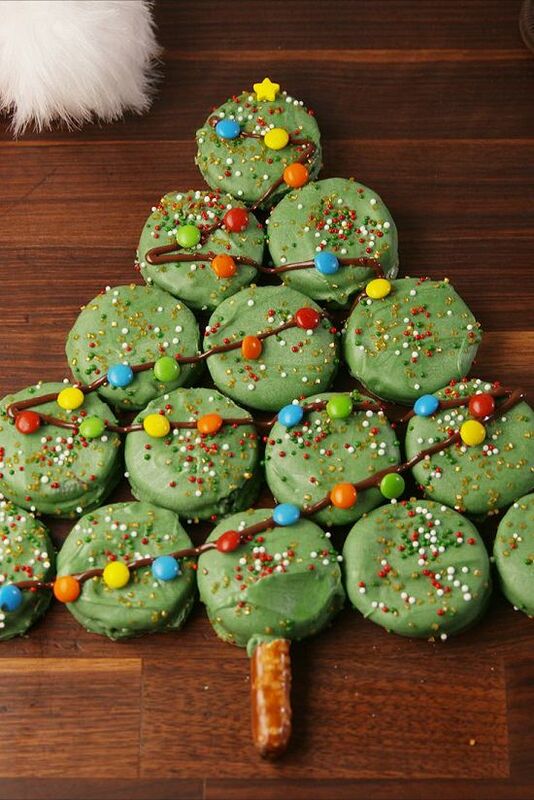 The only way a Christmas tree would be more perfect was if you could eat it. The tutorial is available at delish. 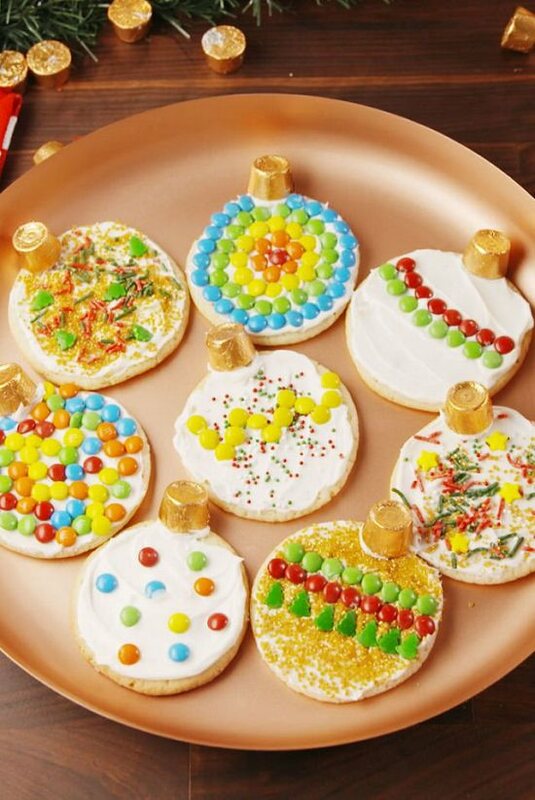 Decorate your cookies with sprinkles, marshmallows, and candies to create rolo versions that bring visual appeal to your dinner table. This recipe is also available at delish. Sized perfectly to fit into the mouth without choking, these Oreo coals are a mouthwatering bunch. Again, Delish is the source of this recipe. 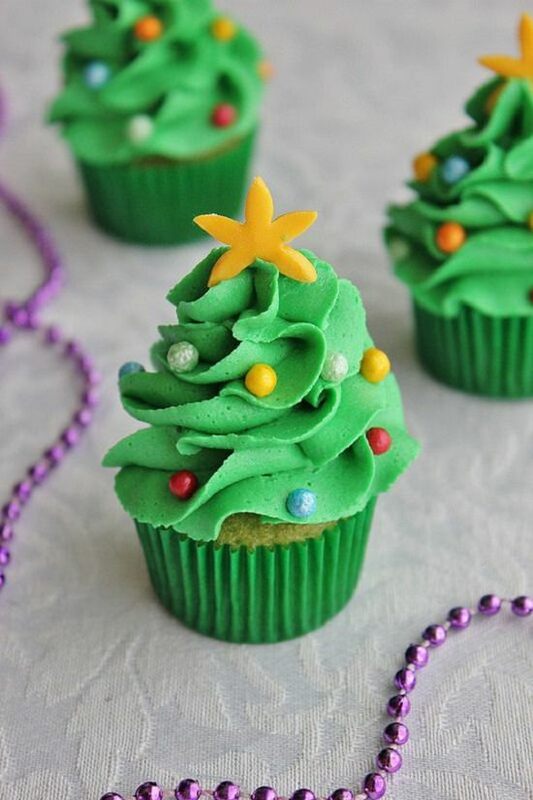 These edible Christmas ornaments are perfect to hang up on the tree. The ingredients with simple steps are at goodhousekeeping. 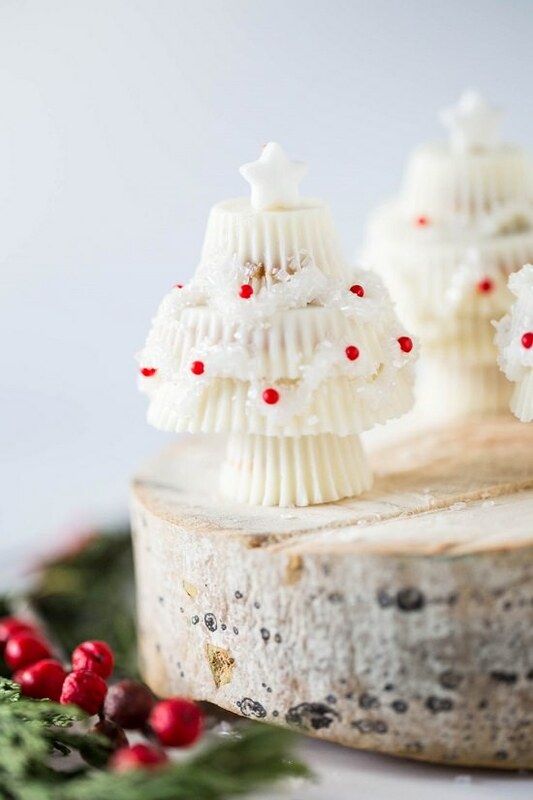 Honestly, decorating this creamy Christmas tree makes more sense than decorating the real one. Delish inspired us for it! 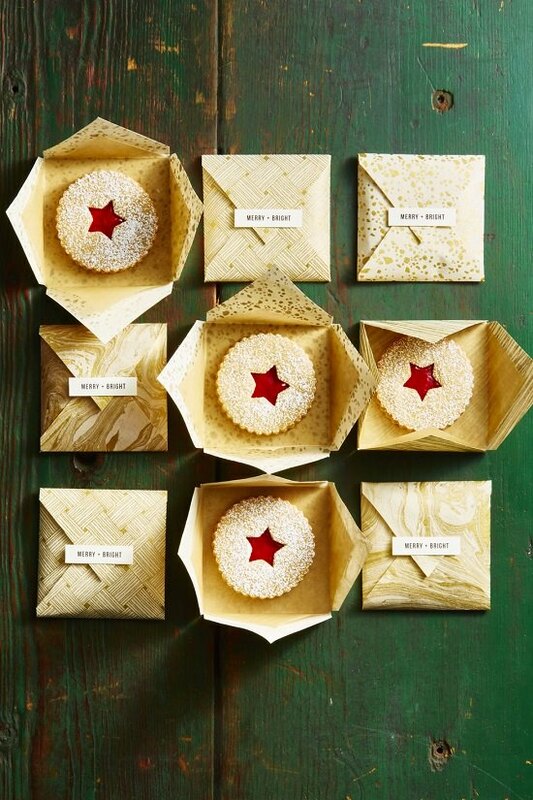 Gifting these sweet treats wrapped in festive envelopes makes your guests feel extra special. Goodhousekeeping provides the detailed info. 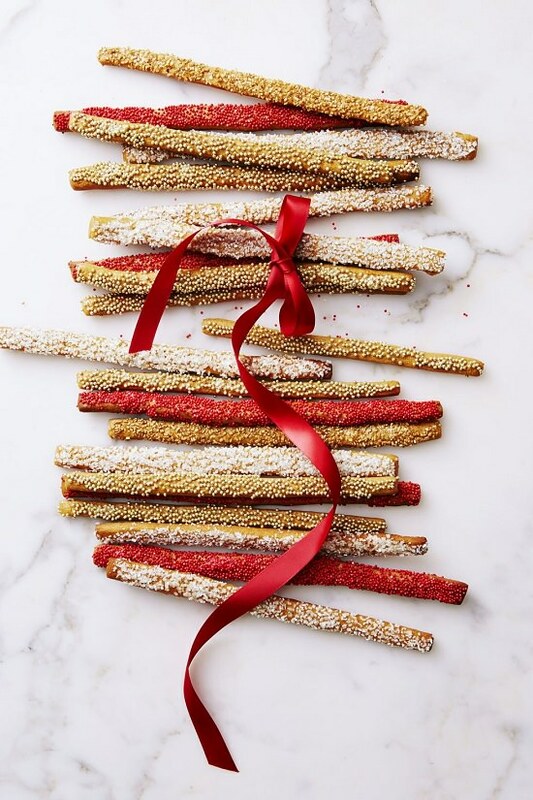 If you want your Gingerbread men all crispy and toasted, consider making these wands instead. Check out Goodhousekeeping for more details! Only a hard-hearted criminal can resist these melt-in-your-mouth buttercream cookies. Here is the recipe! Baked with the goodness of nuts and fruits, these crunchy treats are a must for any party you host this festive season. 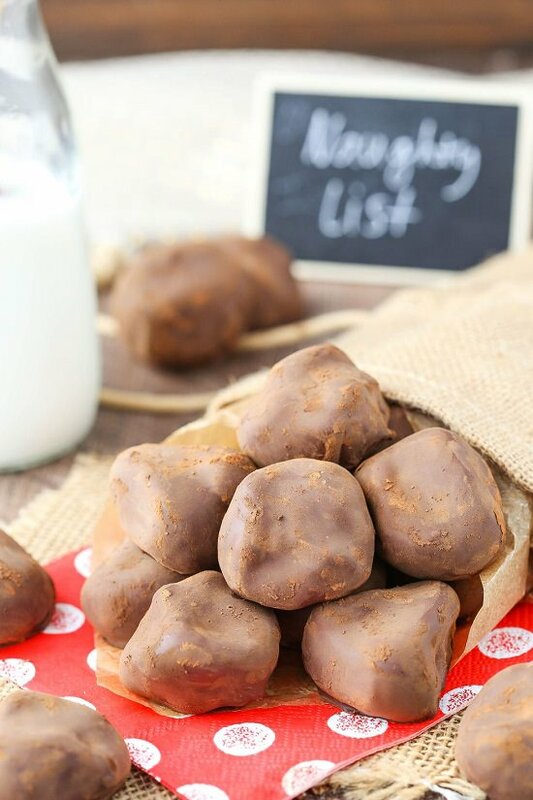 We found the recipe at Thirtyhandmadedays. 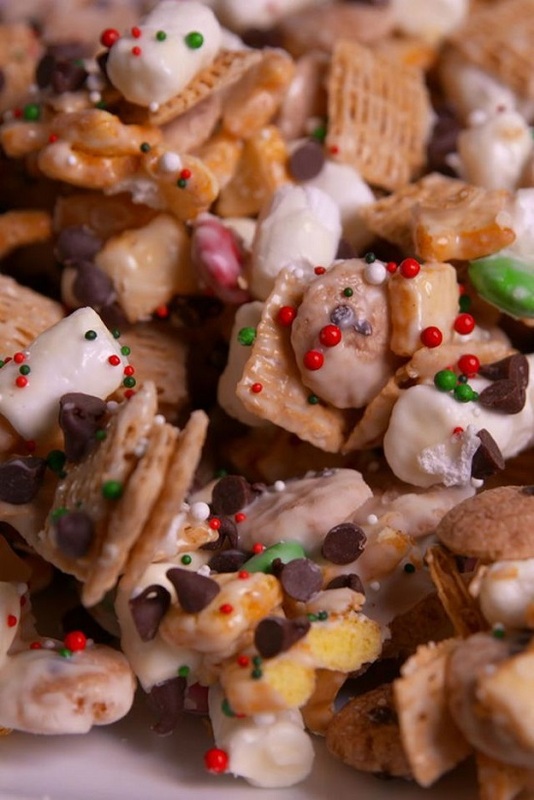 The true candy lover prefers their cornflakes mixed with melted marshmallows and shaped as Christmas-themed wreaths. Thefirstyearblog came up with the idea! 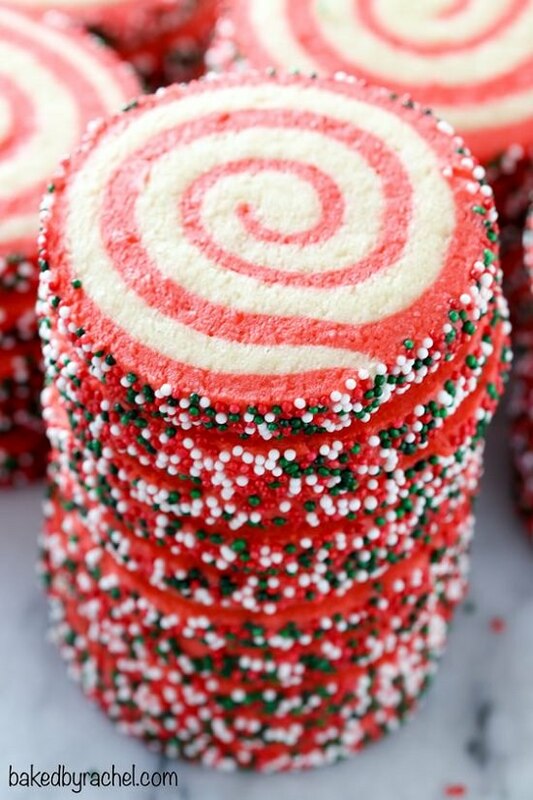 This multi-layered pinwheel cookie is a must-bake for sugar lovers! All the steps are available at bakedbyrachel. No matter how much you eat, your tummy food will always make way for these hot chocolatey bites. This eye catchy cookie cup is also found at Delish. 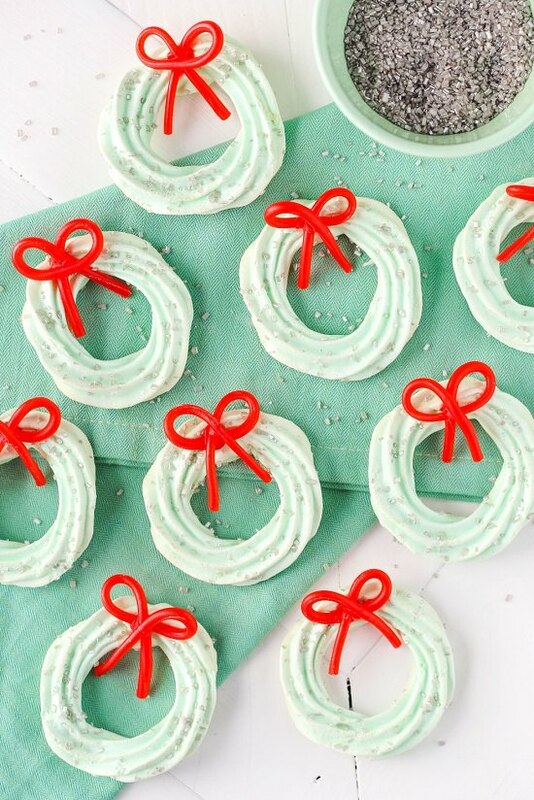 These festive-looking rings of sugar frosting look too pretty to be eaten. Once again Delish is behind the idea! 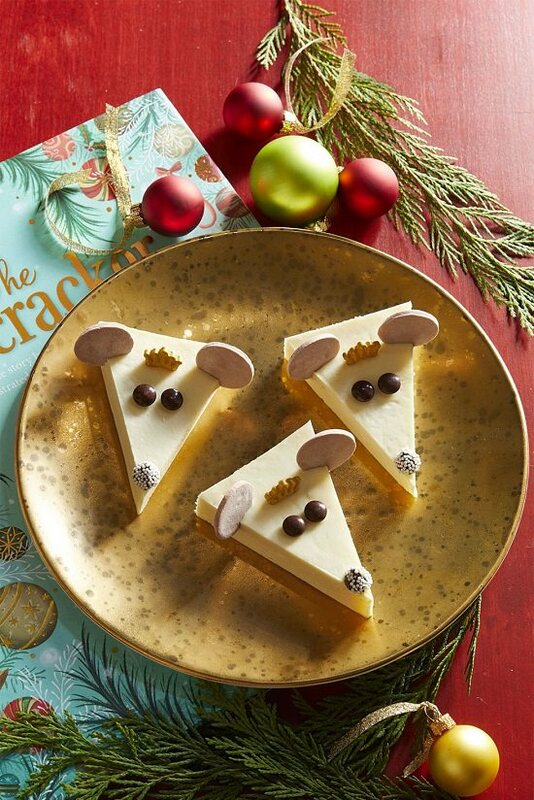 Now, these are the kind of treats that Santa expects from you on Christmas Eve. Get the steps here! 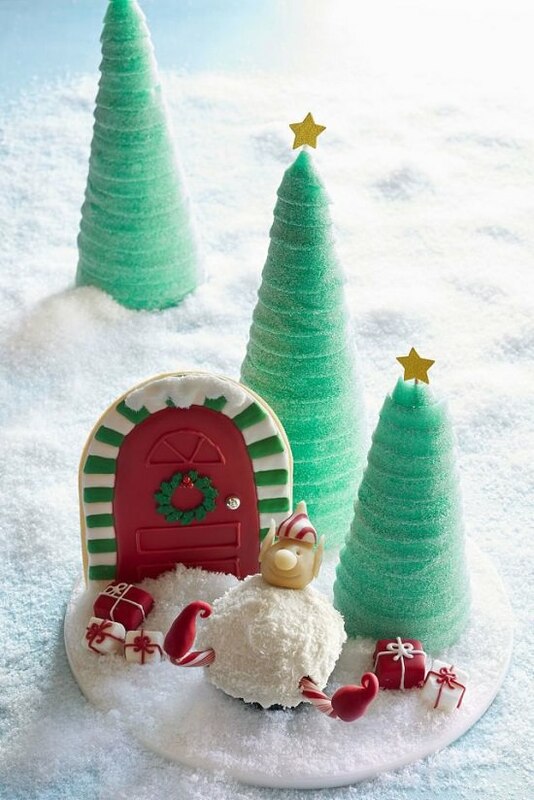 If you think about it, these marzipan treats can double as edible ornaments for the tree. 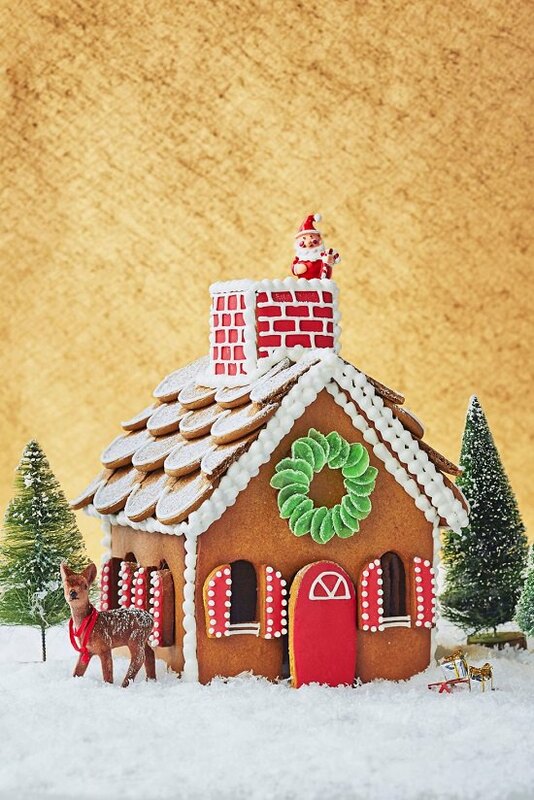 Visit countryliving for the directions. 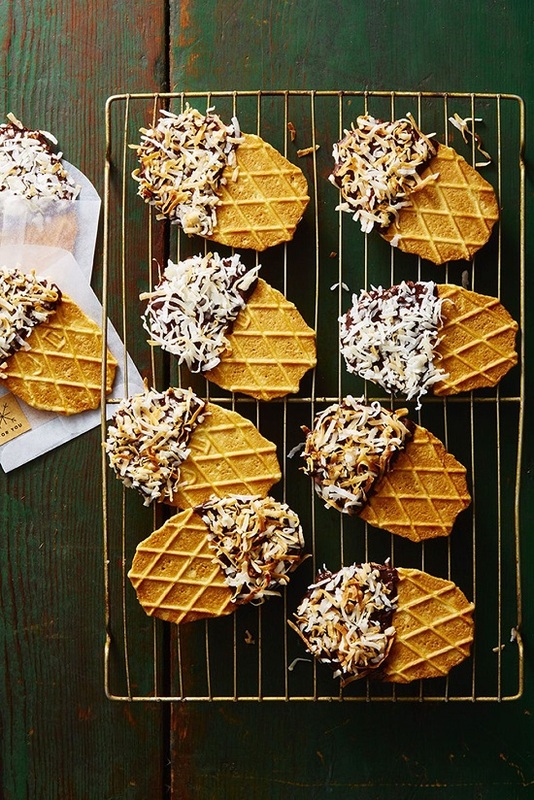 With generous toppings of chocolate and coconut, these bittersweet waffles take 10 minutes to assemble. Check out this post for steps. The only way mice could be adorable was if you saw them in Stuart Little or at their fudge lookalikes. The womansday have the detailed tutorial for it! 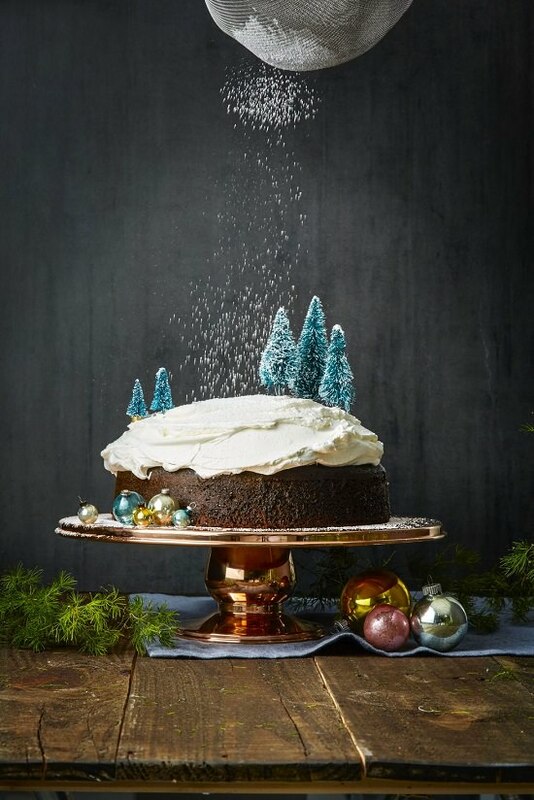 This three-ingredient cake gets all the points for reflecting the colors of the season so well. Find the recipe here! Make a batch of these meringues and save some when particularly frosty days that give you the blues. Click here for the DIY! Never have shortbread squares been easier to customize, while keeping the flavor profile constant throughout. The full recipe is here. 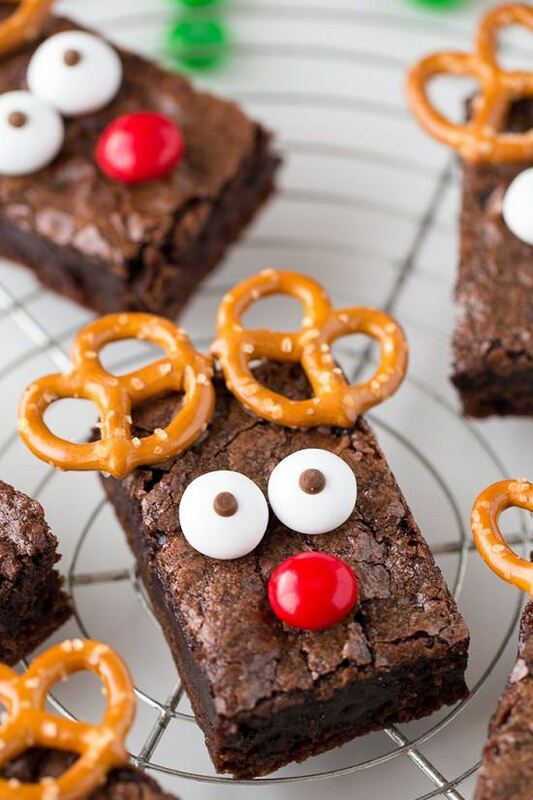 Pop your regular brownies with cherries and candy eyes to make them reindeer style for a fun Christmas party. Find the necessary steps at yourcupofcake. 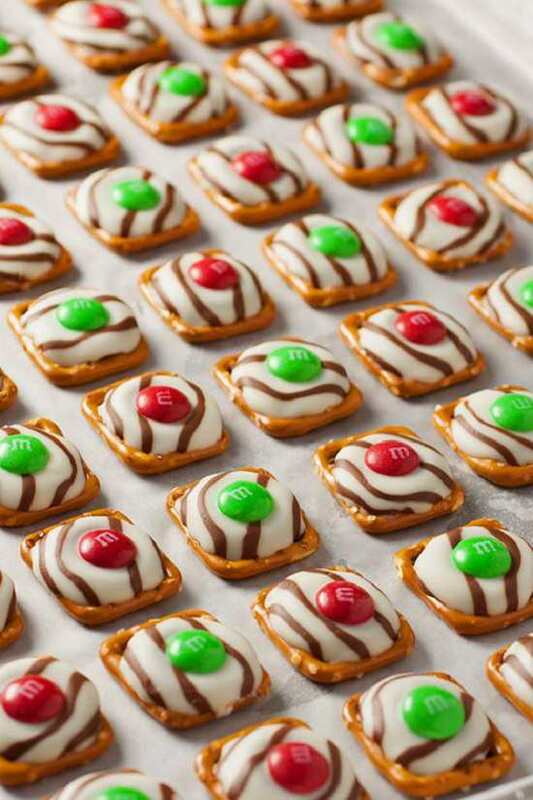 Don’t blame yourself for gobbling up all of these. They are irresistible to any common man. We found the recipe here! 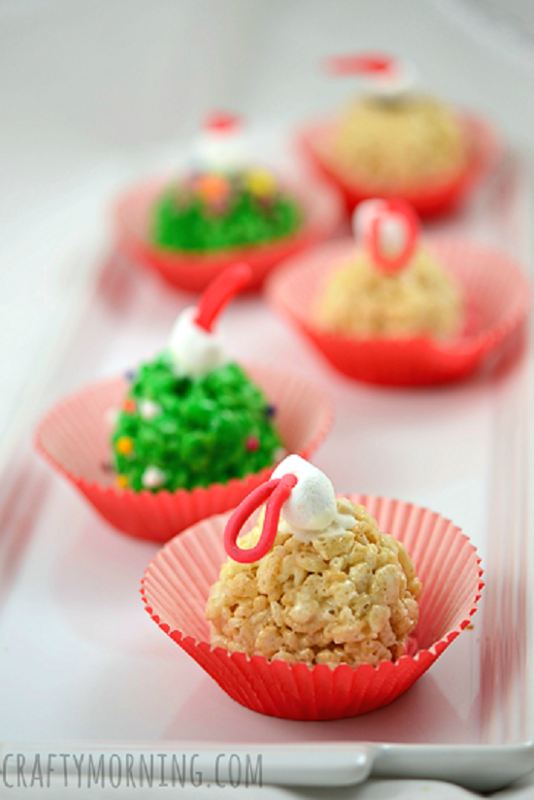 Cereal sticks dipped in colored candy melts brings a healthy touch to your Christmas baking. Plainchicken have the full recipe. 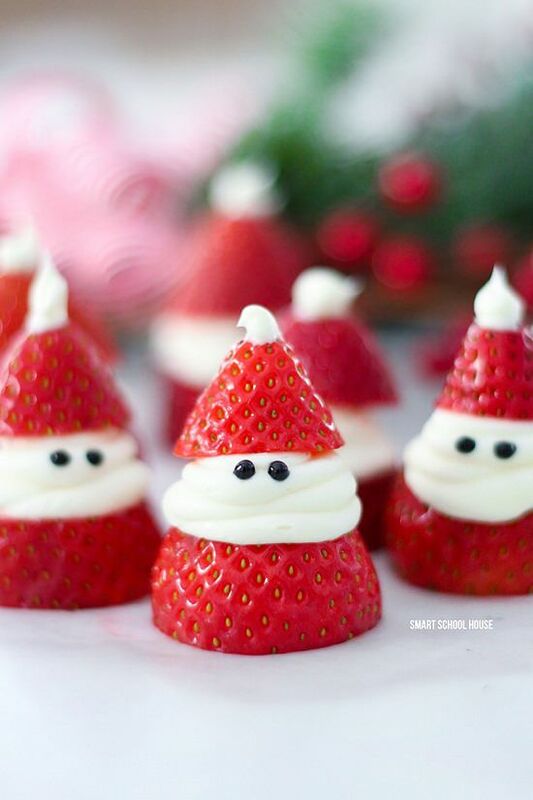 These vanilla-filled strawberries are easy to disguise as Santa’s sentry. Follow these instructions. You will get the directions at smartschoolhouse. 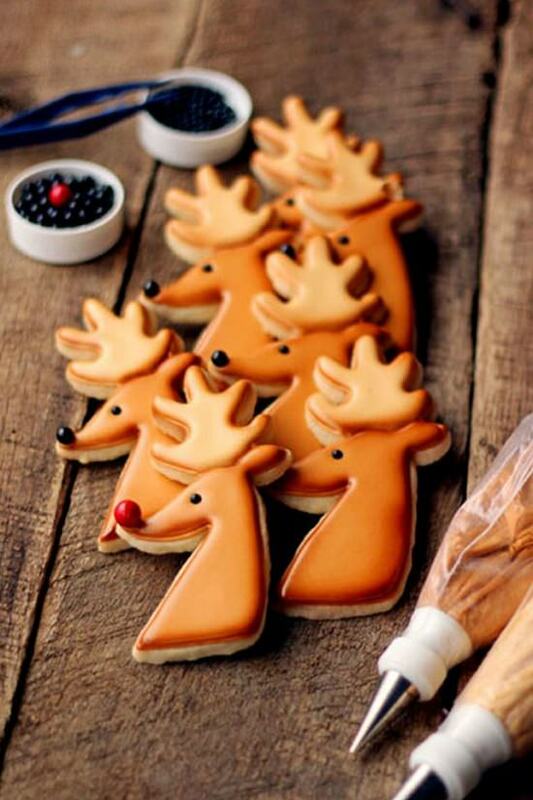 These doe-eyed reindeer cookies are begging to be eaten. Here is the tutorial. 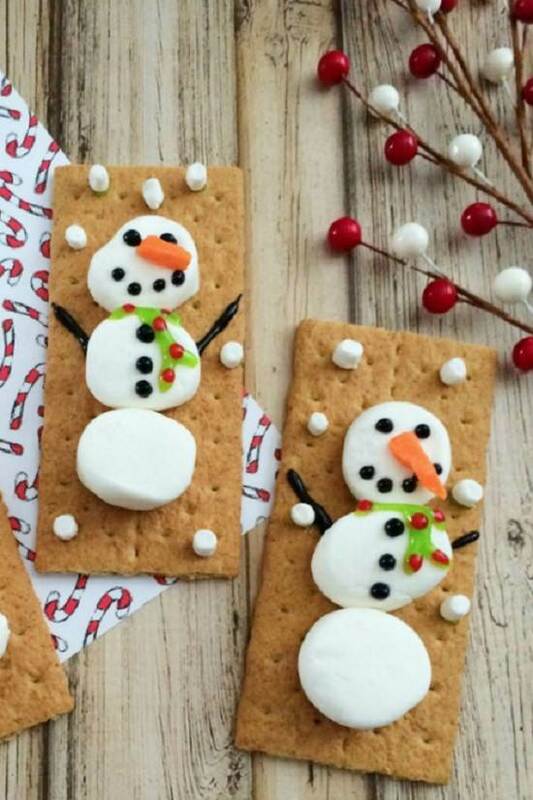 Melted snowmen cookies are perfect treats to end your sugar cravings for once and for all. 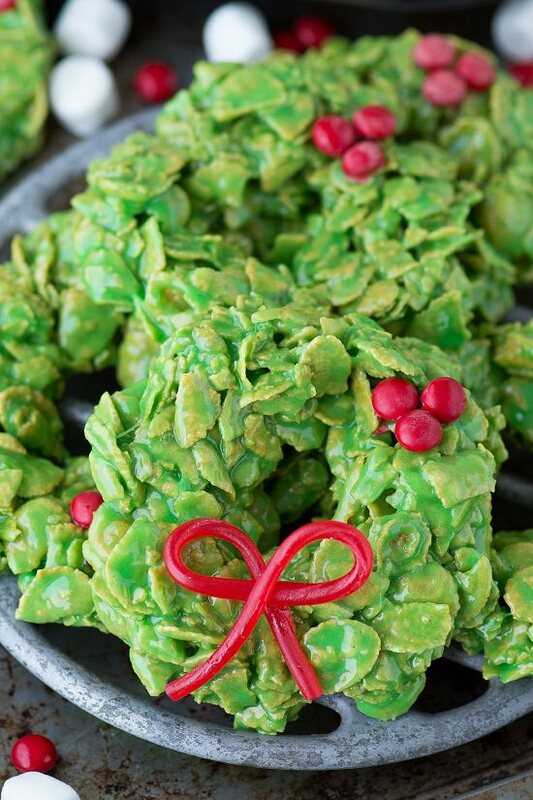 Make these Grinch-inspired munchies for some kid-friendly fun at your Christmas party. See the recipe here! 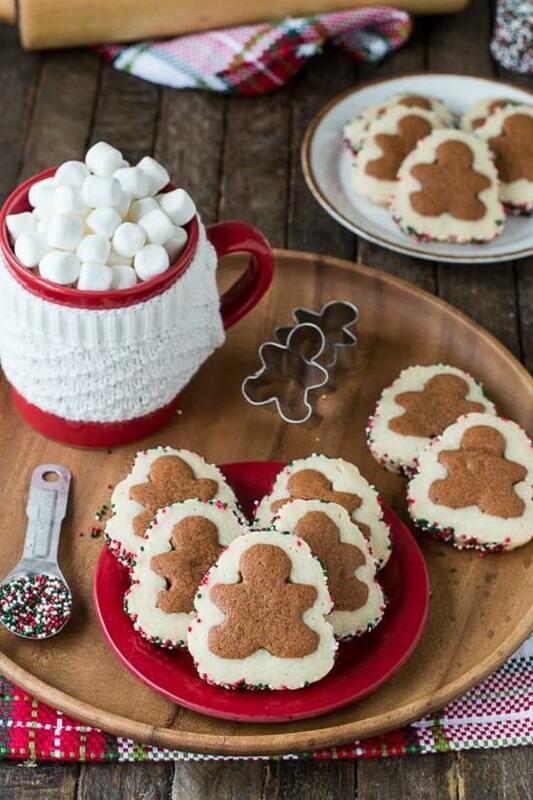 Sipping hot cocoa with these decadent snowman cookies on chilly winter evenings feels like total bliss. How-to is available here. 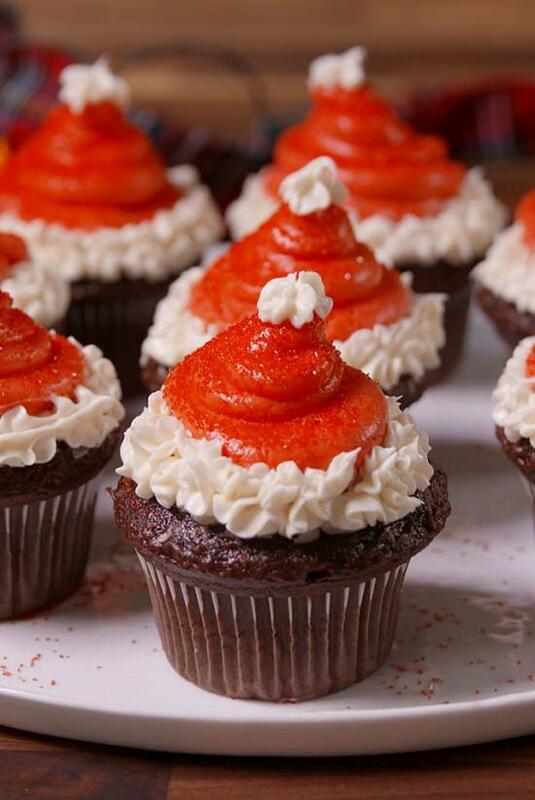 The only way Scrooge could be accepted by all and sundry was by his cupcake lookalike. Follow this article to know more! This whimsical yet charming dessert makes for a jaw-dropping display at the table. Click here to learn more. 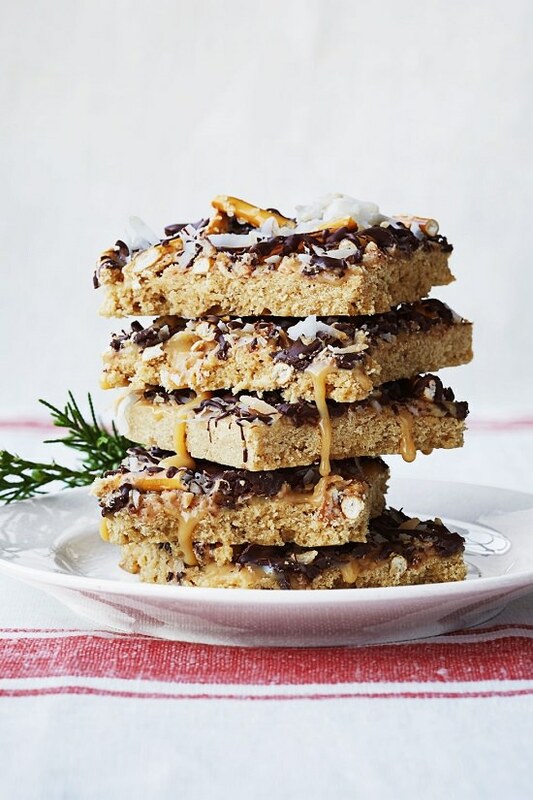 Cookie candy bars topped with caramel sauce take you to old memories of childhood. Get the DIY here! 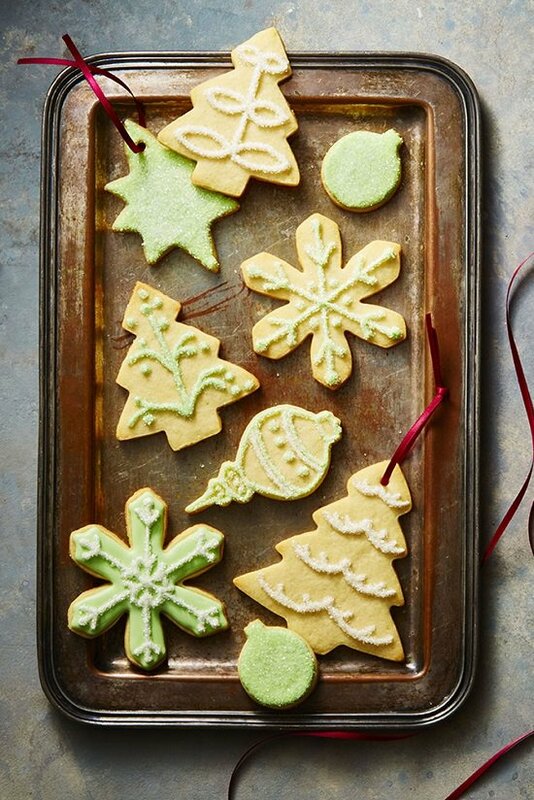 Flaunt your creativity with these easy-to-bake and customize sugar cookies. You will get the instructions here. Flavored with bits of ginger and citrus, this treat gets bonus points for bringing a refreshing twist to the palette. The step by step recipe is here to follow! 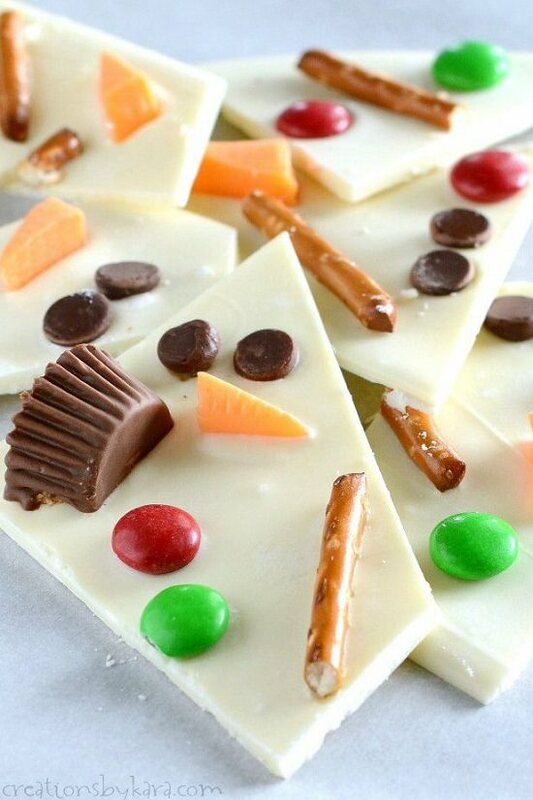 Adding cookies and cream to peppermint bark takes it up a notch higher. Explore more about this recipe at thehouseofhendrix. 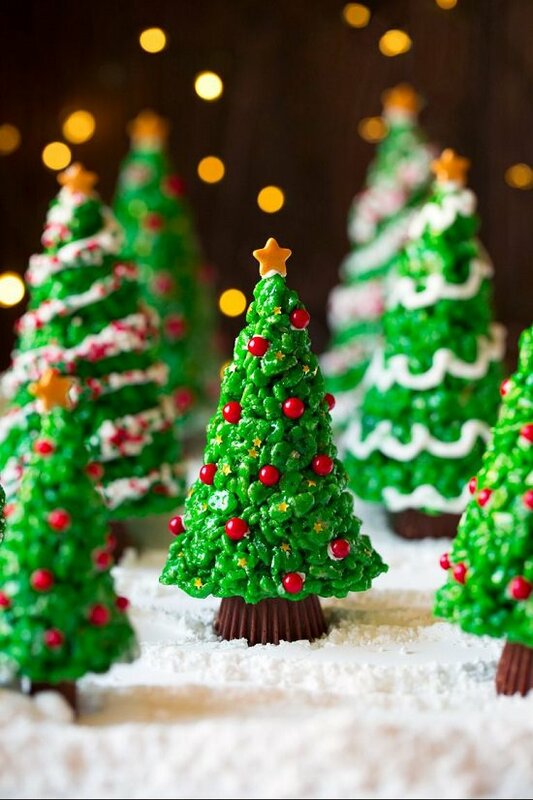 Decorating these mini chocolate trees might just turn out to be the best part of your Christmas party preps. Onelittleproject brought up the idea! 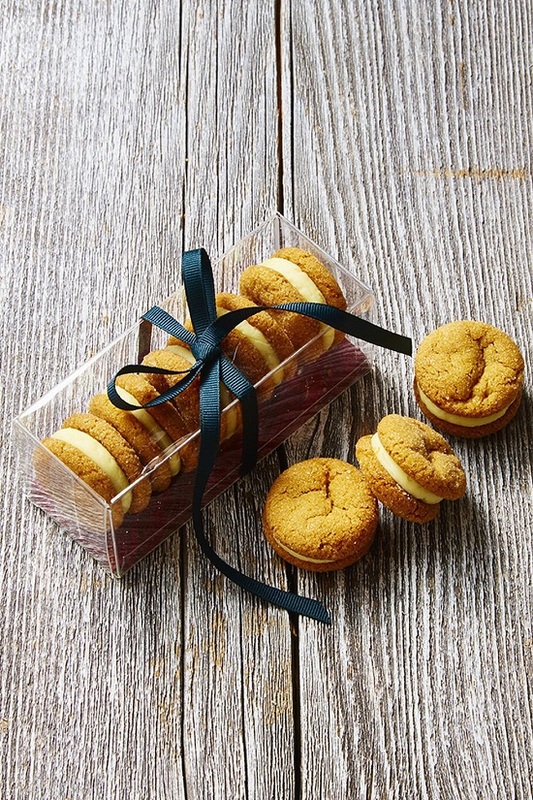 These butter and cinnamon-infused cookies make for a delectable mouthful. The trick to making it is here. 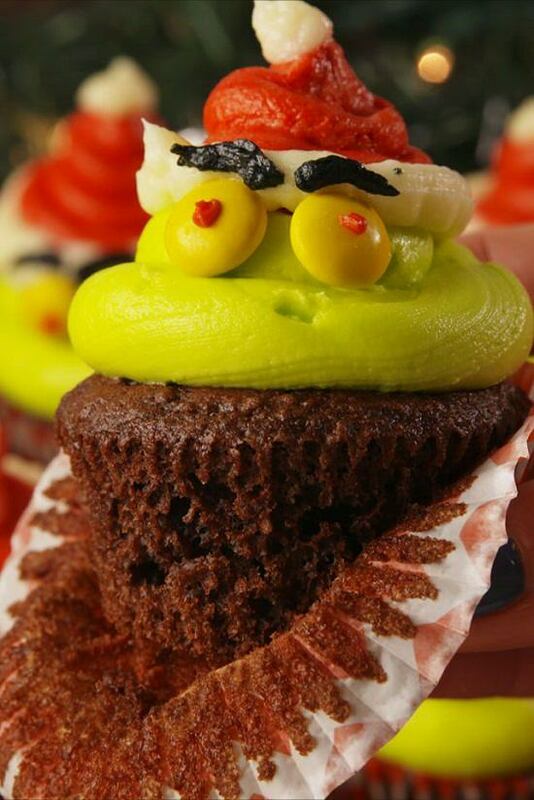 Perfectly iced cupcakes are fun to bake and decorate with the kids. Visit fivehearthome for the tutorial. 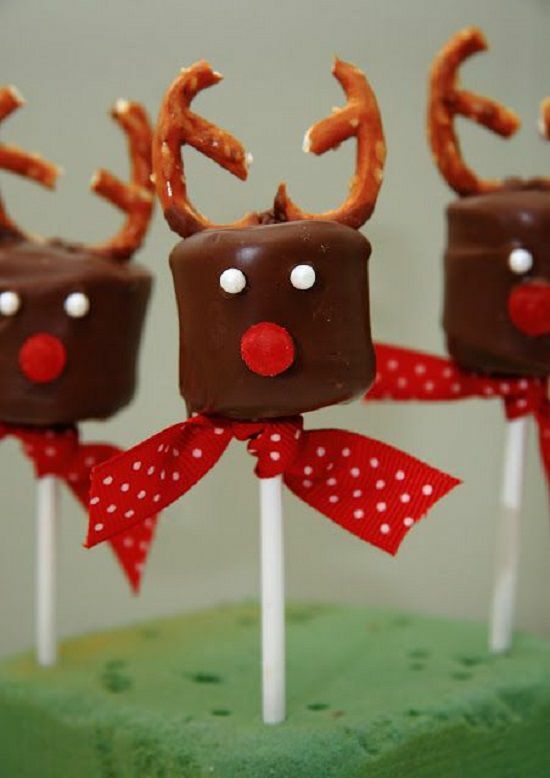 These sinfully decadent Santa pops are actually marshmallows in disguise. The creative treats were found here. 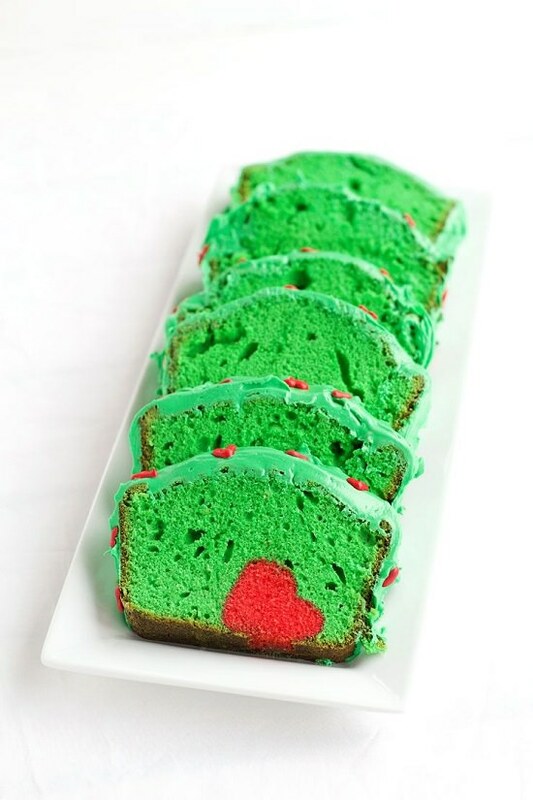 Spongy and super-moist Grinch cupcakes offer a nice color balance to the dinner plate. The method is explained here! 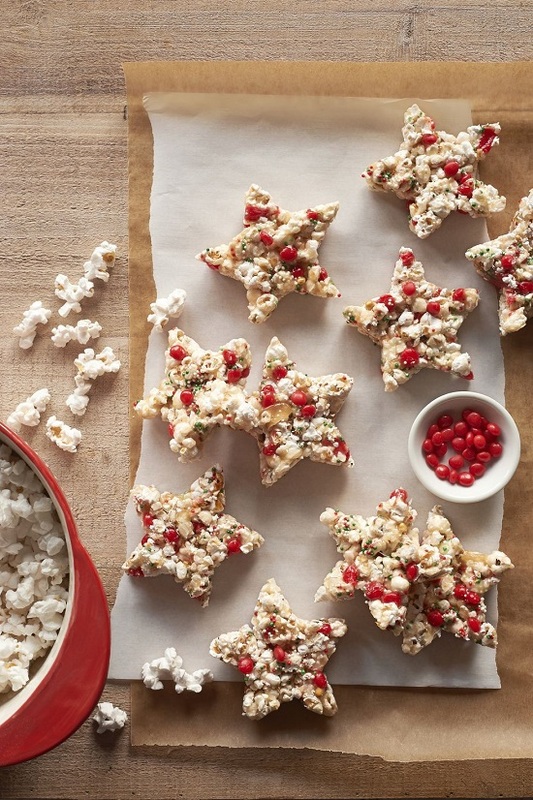 This five-minute assortment of sweet and salty elements makes for a crunchy, post-dinner snack to munch on. Get to know more here. 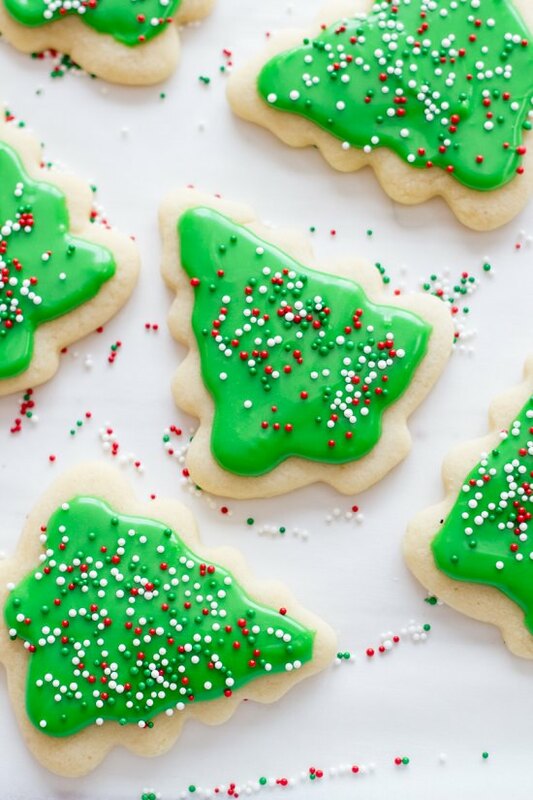 Leave out these milk-centered cookies for Santa and he will put you on his list of good children for next year’s gifts. Read this post to know about the steps. 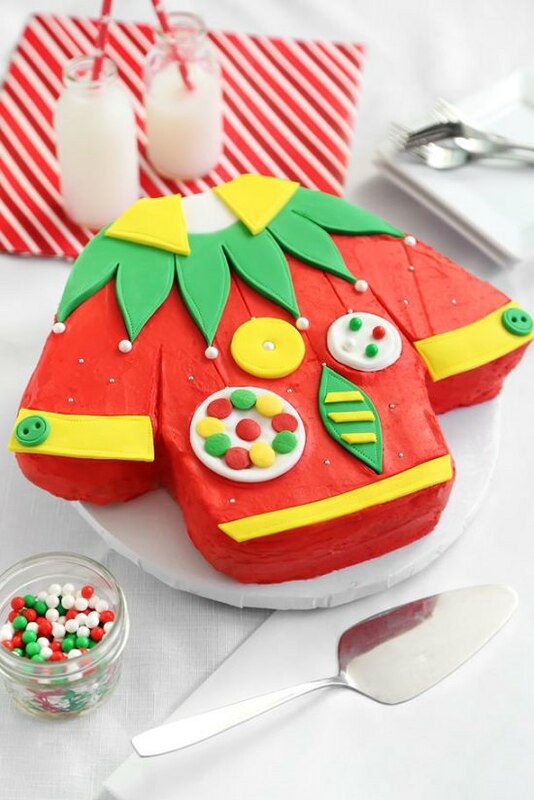 This Instagram-worthy fondant cake has a story to tell! Sprinklebakes are behind the idea! 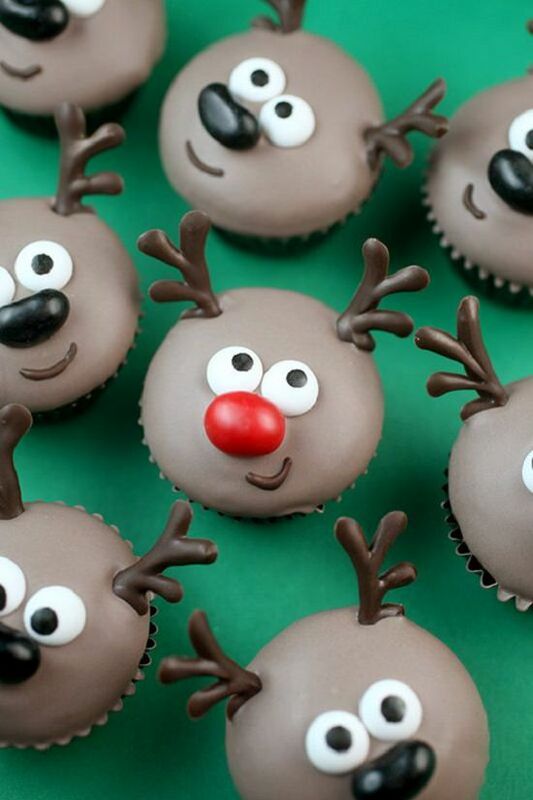 If only you could dress up reindeers for the holidays, this is what they would look like. 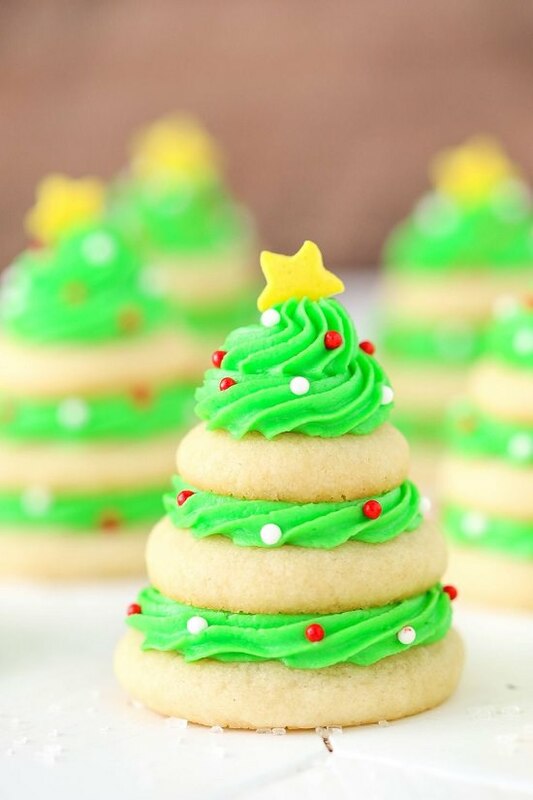 Visit bakerella if you want to make it. 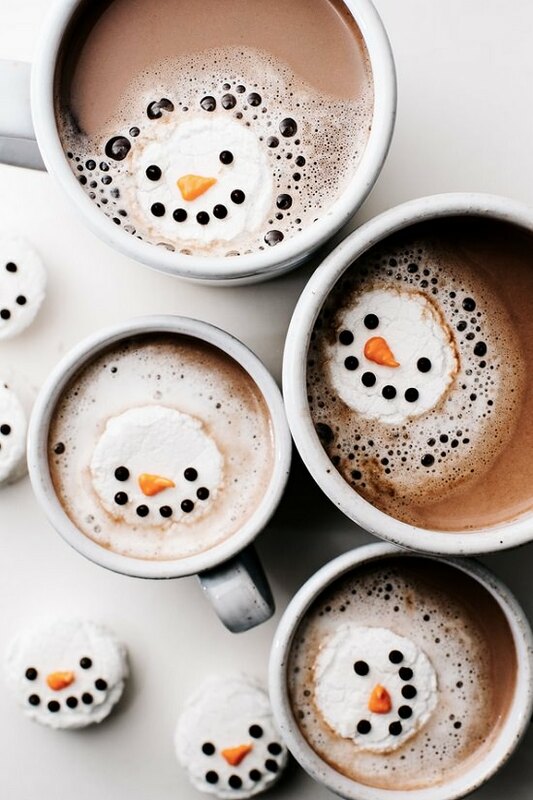 Homemade marshallows with a hint of mint and the face of snowmen are a win-win always! Here is how you can prepare them at home. The best thing about this dessert is that it can be frozen and thawed for instant use at parties where you’re too busy to whip up a treat from scratch. Here is the post to teach you how to create it. 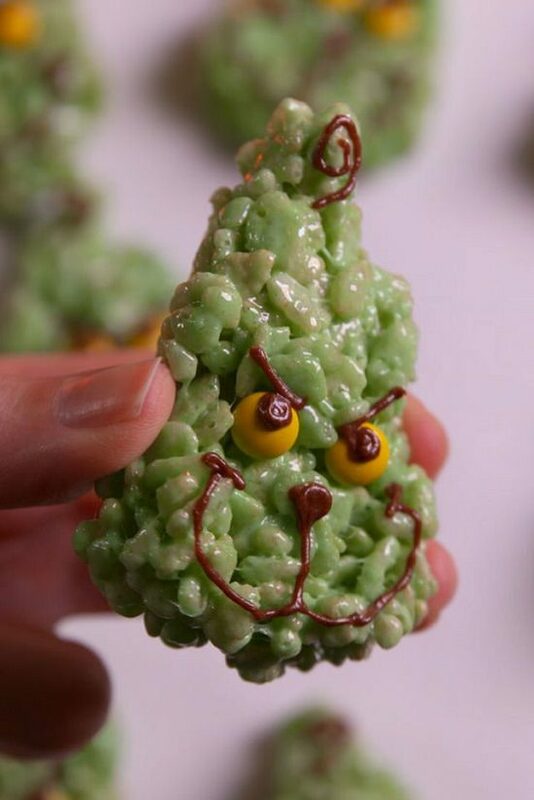 Topped with colored candies, these sweet and salty treats are fun to pop by the cackling fireside. Cookingclass answer all your queries regarding these treats. 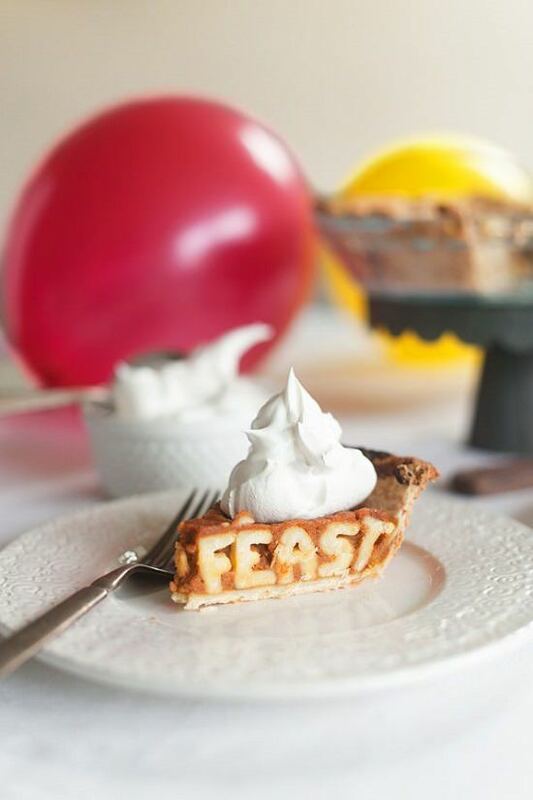 What better than a flavorful pie that talks! Asubtlerevelry explain the method. Crunchy, cream-filled cookies dressed up as Rudolf’s friends are a nice surprise for kids when they come tired after play. Know how to replicate this here. 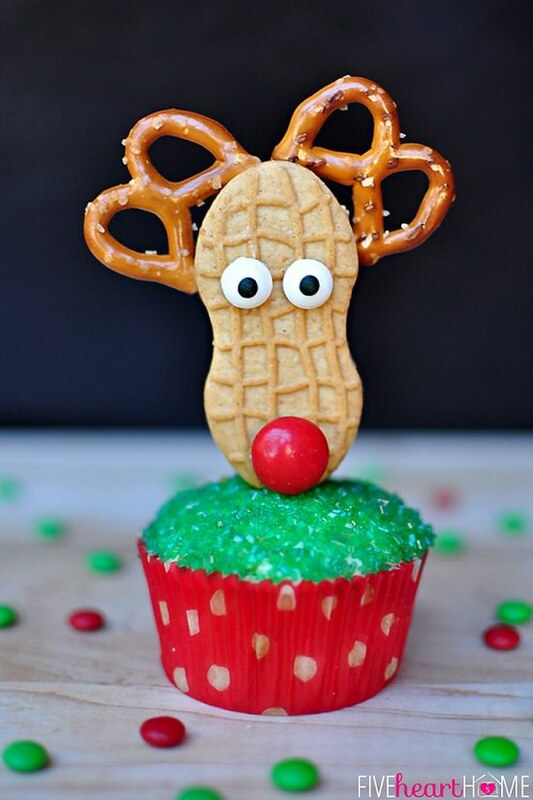 These soft and spongy reindeer cookies are overloaded with cream and cuteness. Thebearfootbaker came up with these uniquely shaped cookies. 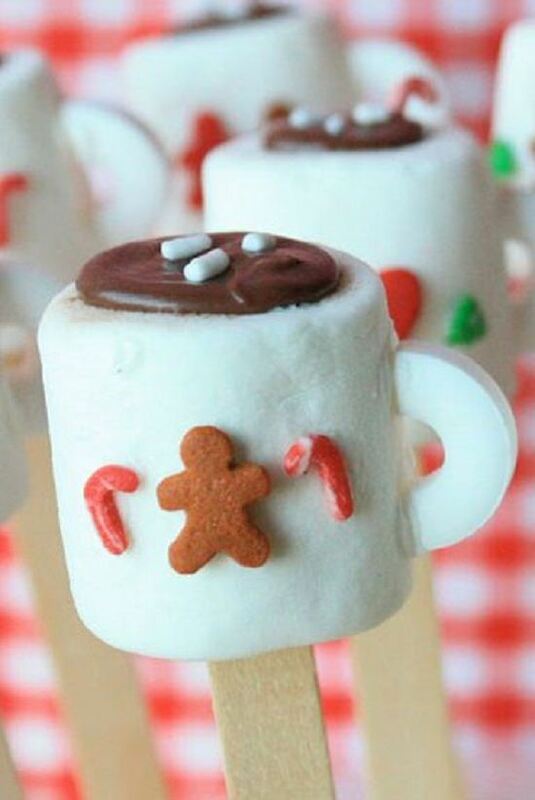 Warm and toasty marshmallow Mini Mug Pops are a nice alternative to large cups of hot chocolate on chilly winter nights. 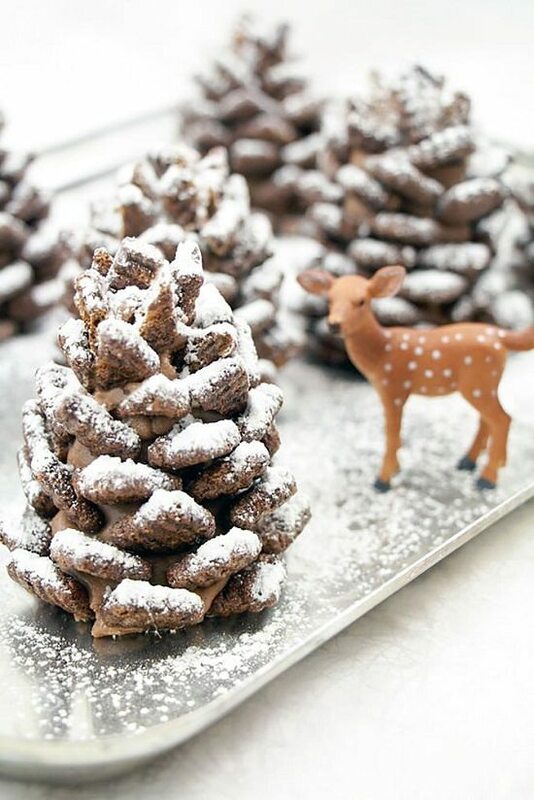 These chocolate pinecones carry the smoky touch of the woods and the irresistible flavor of peanut butter. Follow the steps which are available at Handmadecharlotte. 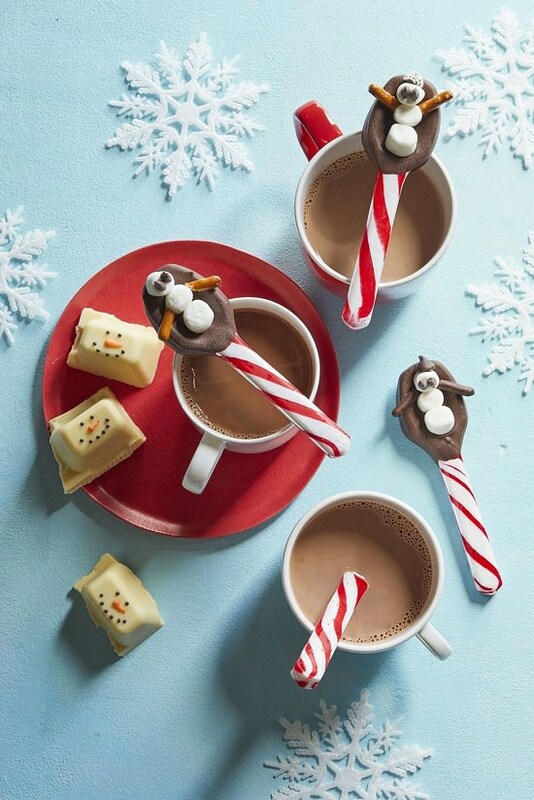 Melted snowmen barks are fun treats to whip up when you’re not in the mood to clean up a lot of mess. 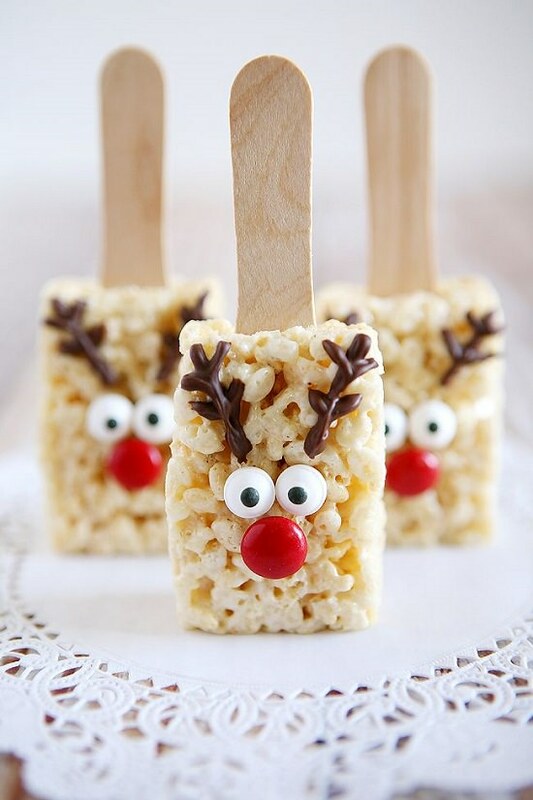 If marshmallows weren’t cute enough, this DIYer added reindeer antlers for a festive touch. We were inspired by yellowblissroad. 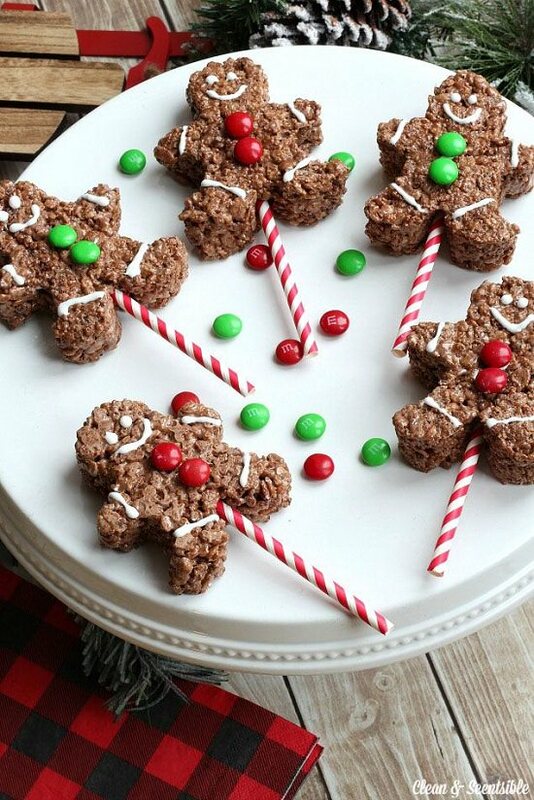 Crunchy and chocolatey gingerbread rice krispee are bursting with flavors so you can’t stop at one. The recipe is here to follow! 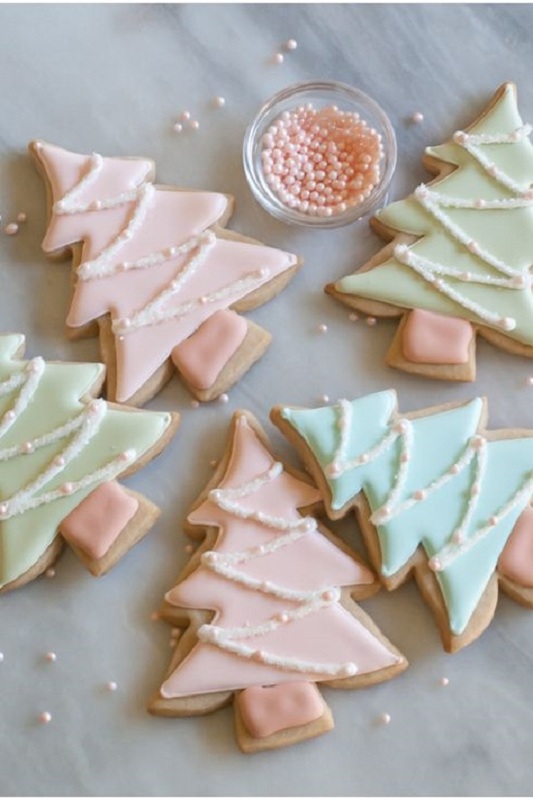 Cream-filled soft gingerbread cookies are a hit at every party. Preparing instructions are here! Fresh out of the oven gingerbread cookies fill up your home with the smell of childhood. Make it using the information at thefirstyearblog. This floral-wreath like dessert is a nice way to uplift your senses on dreary winter mornings. 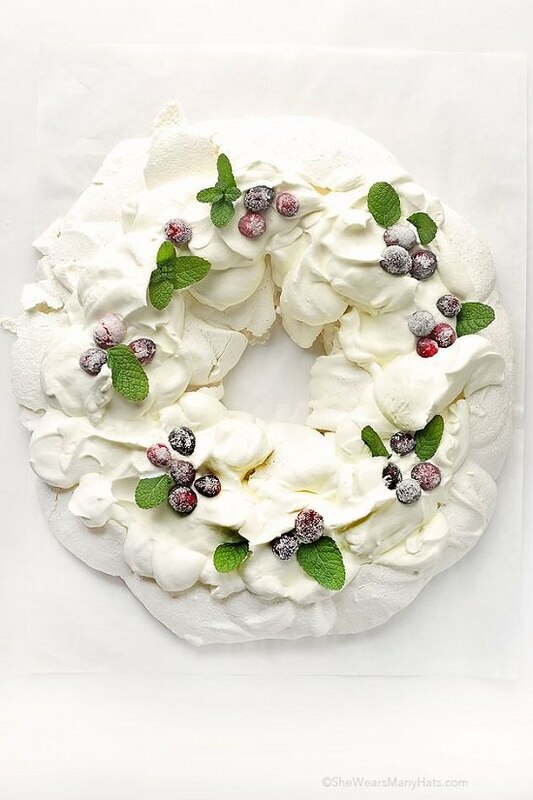 Shewearsmanyhats have the steps for this delicious pavlova wreath. 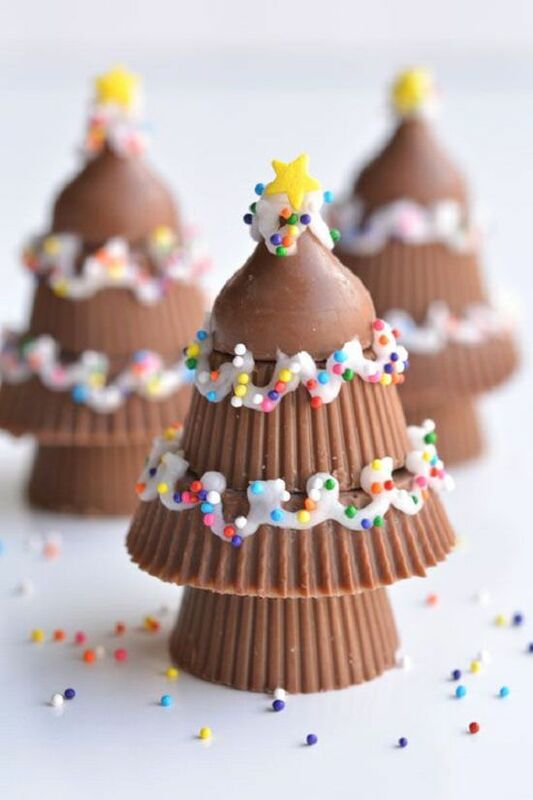 Bursting with flavors of chocolate, peanut, and butter, these creamy white trees are a decadent addition to your plate. See the steps at iheartnaptime. 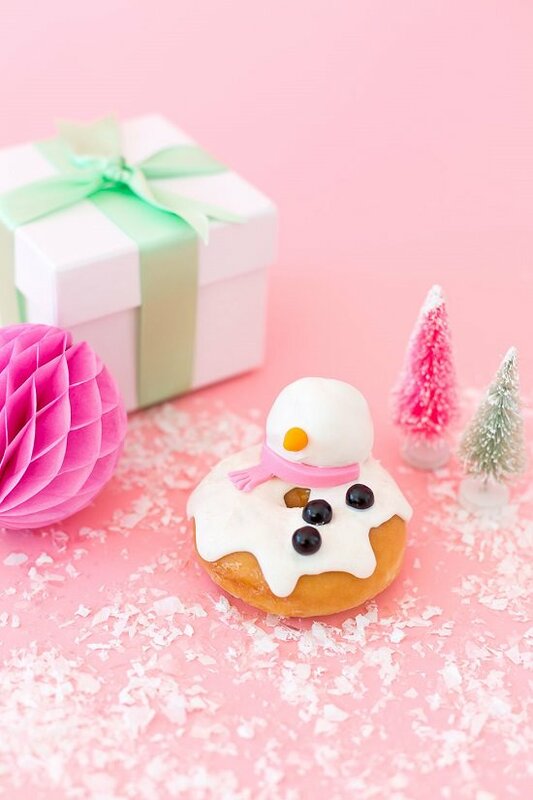 Celebrate the December chills with warm, toasty donuts sprinkled with sugar and frosting. All you need to know is here. Animal-shaped cookie treats are always a hit at every party. Consider knowing more about it at Afewshortcuts. 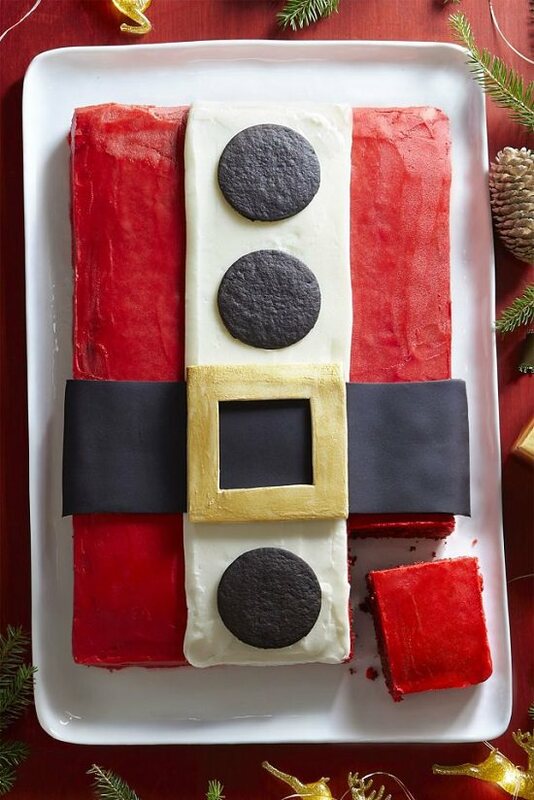 Here’s a jaw-dropping Christmas dessert that also doubles as a buffet table decor for the party. Here’s the recipe! Don’t worry about your snowmen melting this time. 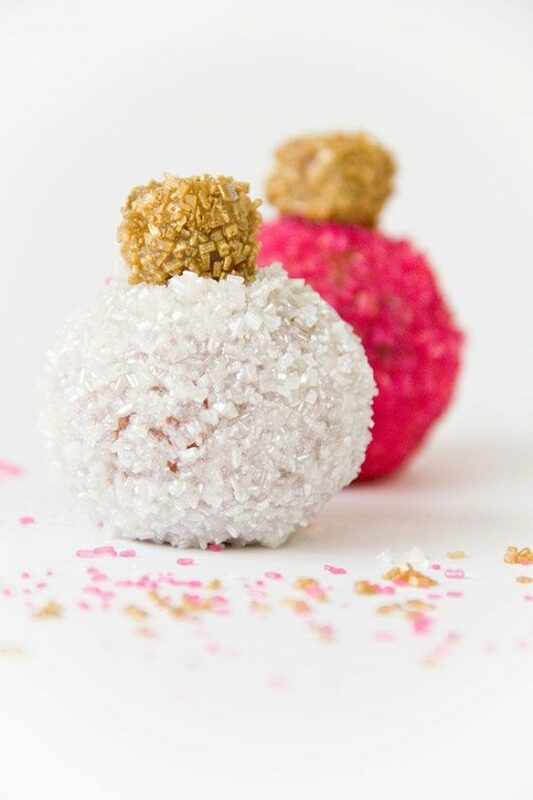 These sweet treats are surprisingly robust. Frugalcouponliving brought up the making of this. 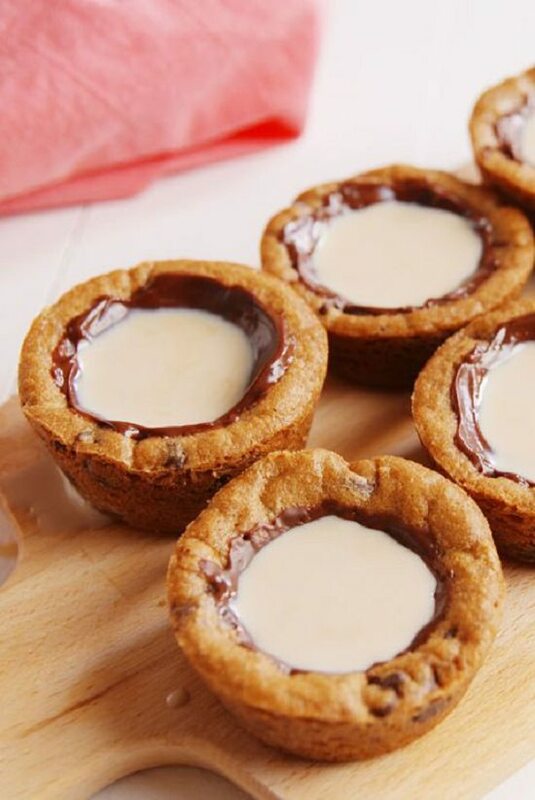 With a tough cookie dough on the outside and a hot, gooey filling inside, these chocolate cups are irresistible on cold winter evenings. You can see how it was made at Thegunnysack. 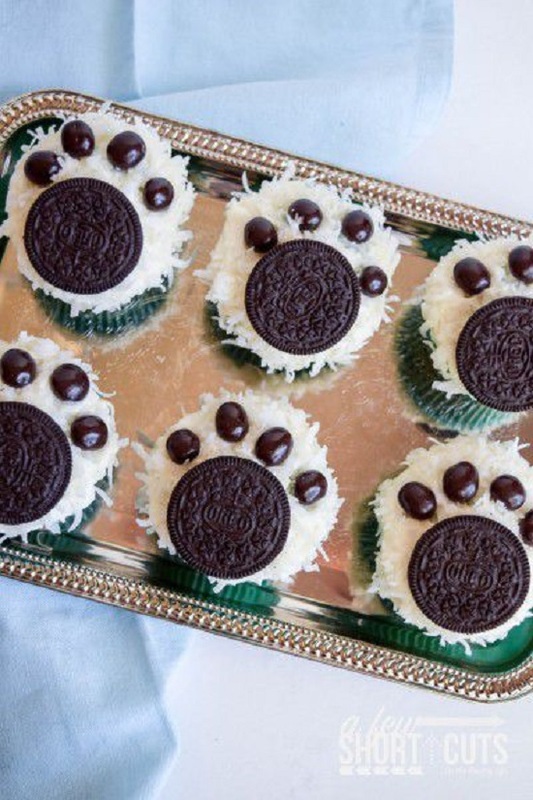 These adorable treats are too pretty to eat, don’t you think? Time to get crafty in the kitchen! Read the steps at craftymorning. 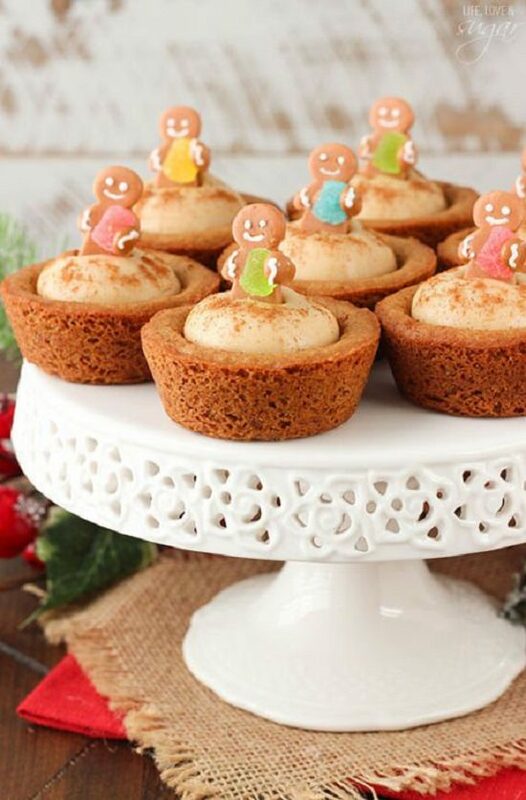 Cozy up on Christmas Eve with these delightful cinnamon cookies shaped in the form of cute cabin munchkins. Click here if you don’t want to miss its recipe!